Its getting to travel season for many. My eyes boggle at the amount of luggage, people take with them. Its hard work, its nerve wracking sometimes and if you are over your weight limit, its expensive. its faster at check in- no luggage means a check in at home and straight to the gate (time saved 15-60mins). I fly about 90 times a year- time saved is between 22 and 54 hours!). Of course staying at home would save me more time! The other bag is officially my “personal item” (in this case a computer bag). It clips to the first for easy carrying. They also have a maximum sized bag you can carry on. My bigger bag usually meets the requirements being 51cm (20″) x 33cm (12″) x 21cm (8″). Different airlines have different requirements, so check your carrier! 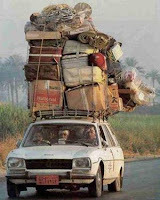 Tomorrow I will talk about reducing your load!